Sautee onions, carrots, celery, and garlic in a skillet with olive oil for 10 minutes over medium heat. Stir the veggies a few times. Add ground beef, and ½ teaspoon salt and pepper. Crumble the meat with a heatproof spatula and cook until the beef is no longer pink. Add tomato paste, wine, and crushed tomatoes then simmer for 15 minutes uncovered. Add milk and let the sauce come to a gentle simmer, stirring frequently. Add nutmeg, then continue cooking at a gentle simmer for another 15 minutes, uncovered. Stir in 4 tablespoons Parmesan, and salt and pepper to taste. 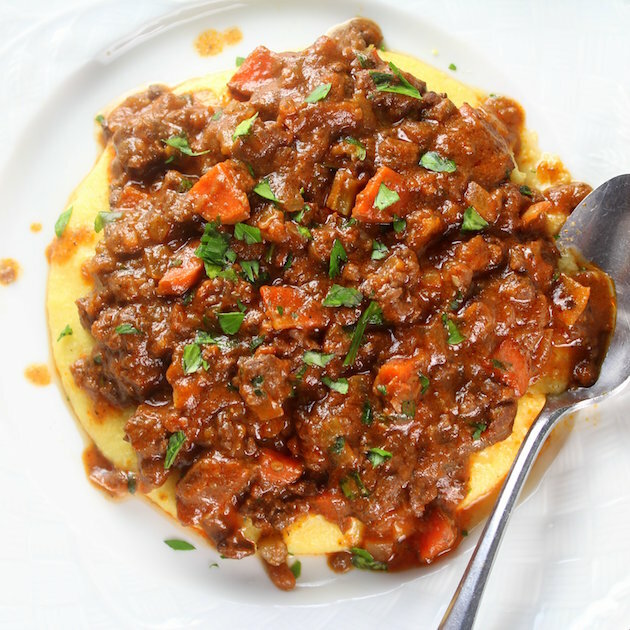 Serve over Polenta Parmesan, and garnish with chopped parsley and grated Parmesan. 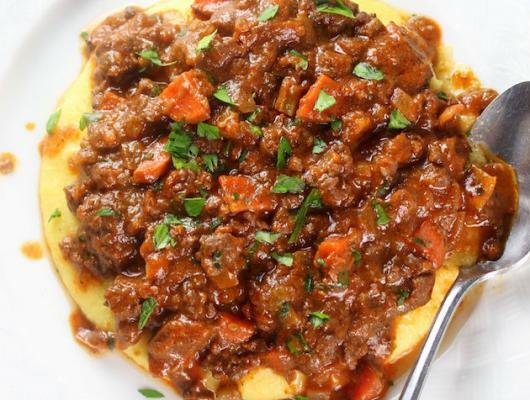 Parmesan Polenta Bolognese: Hearty meat sauce is layered over creamy Parmesan polenta & topped off w/fresh parsley + grated Parmesan.